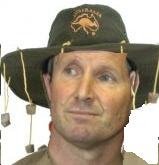 Thanks to Sportsfreak for pointing out a somewhat bizarre situation in New Zealand where many rugby fans, mainly from Canterbury it must be said, have taken the decision not to continue supporting their national team because their beloved Robbie Deans was overlooked for the All Blacks coaching job. Not only that, with their hero having now taken up his role across the Tasman Sea in charge of Australia, several "fans" have called the popular New Zealand Talkback radio show to declare that they are now switching their allegiance to the Wallabies. Those turning their backs on the All Blacks include opinionated NZ Herald Journo Chris Rattue. According to Rattue, "it's an outrage, what happened, and it will never go away while Graham Henry remains in charge. Because Robbie Deans was denied his rightful place as the All Black coach." Graham Henry's re-appointment "was done for personal agendas and that's my problem with the All Blacks now. They no longer really represent rugby in this country they're representing personal agendas and that's how Graham Henry ended back in control. Not on merit." As a result Rattue will "never cheer for a team coached by Henry. No team in black will ever represent my sporting fervour while he is in charge." For Sportsfreak it is "incomprehensible" that there are some people willing to turn their back on their national team simply because they didn’t get their choice of coach. Regrettable, yes - but incomprehensible? Rugby does, after all, provoke all sorts of emotions and such extremes of feeling are not restricted to New Zealand. I certainly recall reading various message board posts by England supporters during the respective reigns of Andy Robinson and Brian Ashton suggesting that they would rather England lose if it hastened the departure of the regimes in question. I don't think I would ever go that far, but passion does drive people to extremes and reactions like this are, to an extent, understandable. What is completely incomprehensible, however, is for New Zealanders to start supporting the Wallabies. Under any circumstances that's just plain silly. There’s a difference between cheering against your side in order to hasten the regime’s demise and only cheering against them when they’re playing a side coached by your former provincial coach though.